After Thanksgiving, I get into holiday-cookie mode. 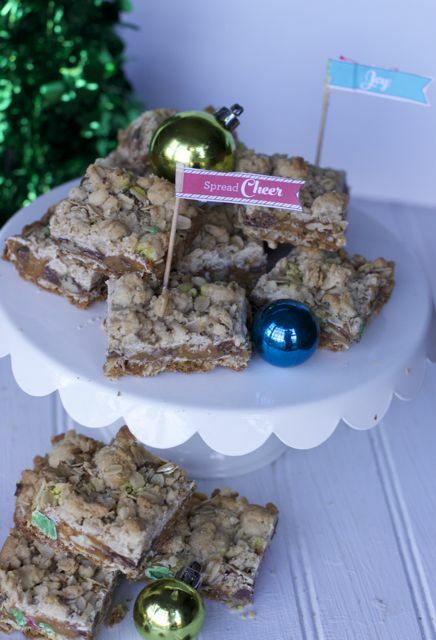 I have been involved with a holiday cookie exchange for more than 12 years, and it’s so fun coming up with a new recipe each year. As the host, I include contests each year for “most festive” cookie, “better luck next time,” etc. This really gets guests excited about coming and putting their best baking foot forward as creative bakers. Though I can’t win any of the prizes, I am in the process of testing out my cookie for this year. I thought I would concoct a twist on a cookie I used to make several years ago: Christmas Oatmeal Carmelitas Recipe. 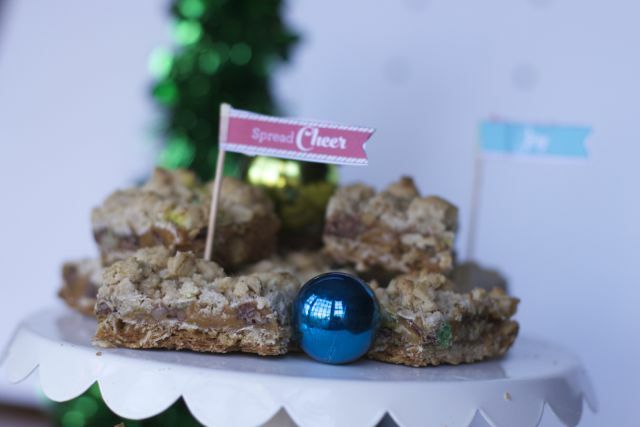 To create a more festive look for this traditional bar recipe, I used NESTLÉ® TOLL HOUSE® Red and Green Morsels instead of traditional chocolate chips. If you haven’t seen these yet, you can find them in the baking section at your local Walmart. 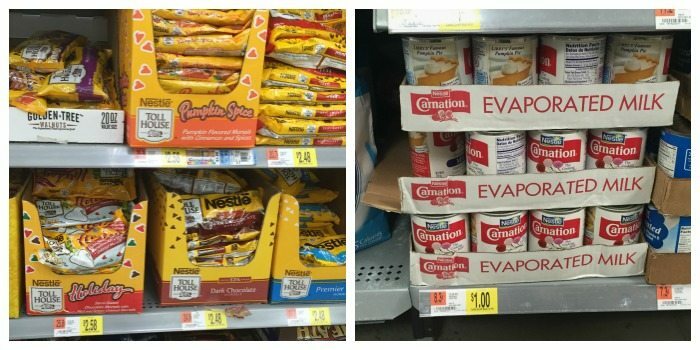 Often my Walmart will have a holiday baking section located in front of the aisles with things you might need for that baking season. I also picked up a few cans of NESTLÉ® CARNATION® Evaporated Milk. 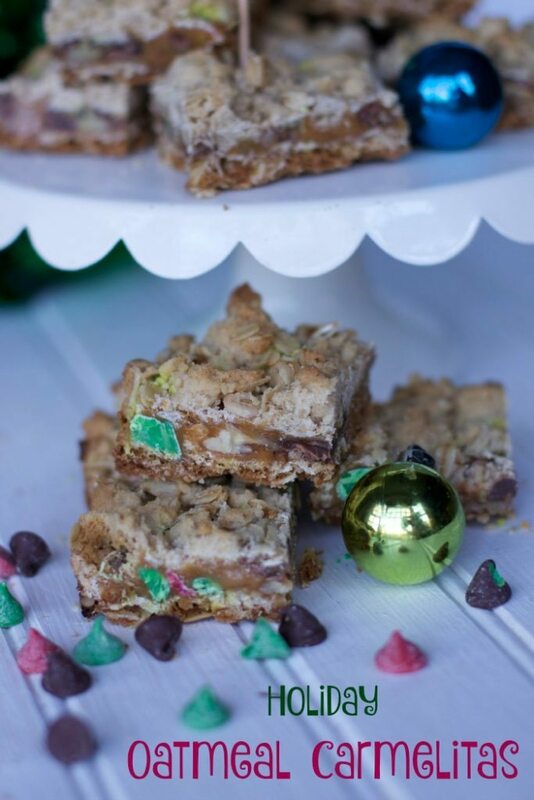 Be sure you don’t buy condensed milk, as that is a totally different animal (great for cookie bars like Magic Bars, but not for this recipe). If you are like me, you usually have a pantry stocked with at least one can of each just in case. 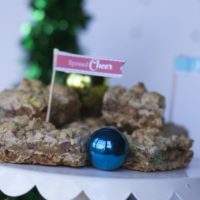 I love cookie bar recipes because you can make the batter all at once, and when you need to make six dozen cookies for a cookie exchange, it’s nice to not worry about six-dozen balls of dough. The biggest task you have is cutting them evenly!! 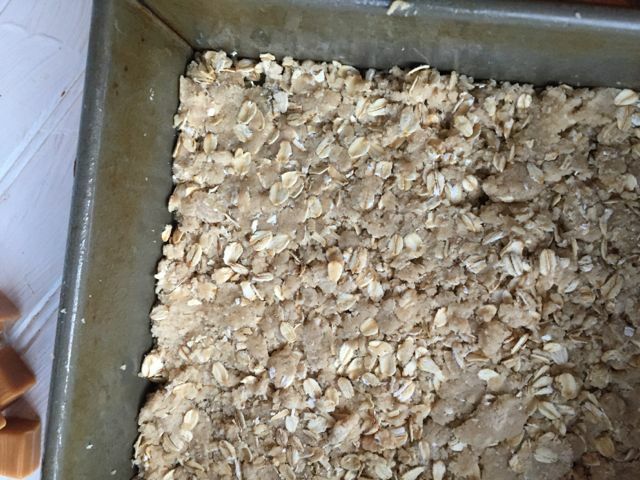 This Christmas Oatmeal Carmelitas Recipe begins with a simple cookie dough of brown sugar, butter, flour and oats. Layer half the batter into your prepared pan. Make sure it is entirely covered, as this dough does not spread. Bake for 10 minutes. 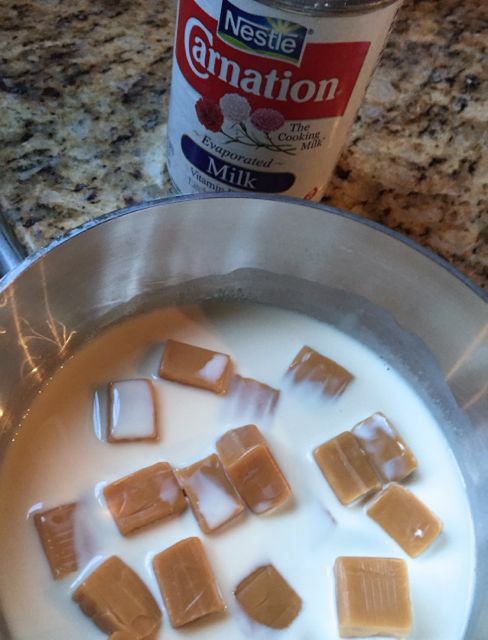 Meanwhile, make your caramel sauce by melting caramel squares with the NESTLÉ® CARNATION® Evaporated Milk in a pan. Stay by the stove and keep stirring so you don’t burn the mixture. 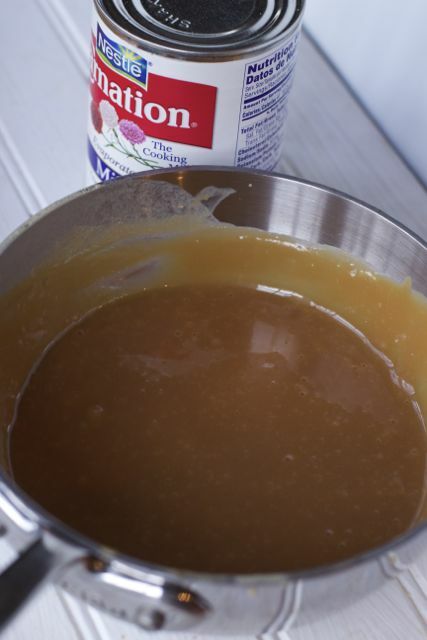 You can use this magical caramel sauce for just about anything!! Here is what the finished caramel sauce looks like…yummy I could end the recipe here. Now layer your nuts and NESTLÉ® TOLL HOUSE® Red and Green Morsels over the oatmeal crust. Cover with the slightly cooled caramel sauce. Mine was probably a little too warm, as you can see some melting of the green morsels. No biggie; it all tastes the same. Sprinkle the remainder of the dough on top of this mixture and bake per the directions. Allow to cool for at least five hours before cooking. Another great thing about this recipe? You can make it the day before your cookie exchange and cut them the next day. 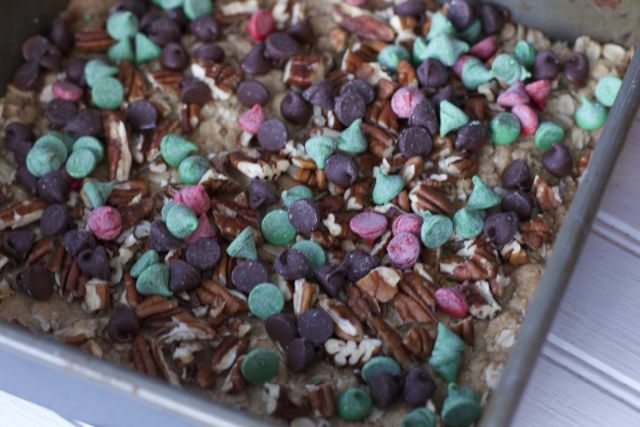 You can also bake these bars and freeze them whole until the day before as well. Now that they are cut and ready to go, be sure to add one of these cute free Holiday printables to your packages. At our cookie exchange, “presentation” can win you a prize as well. 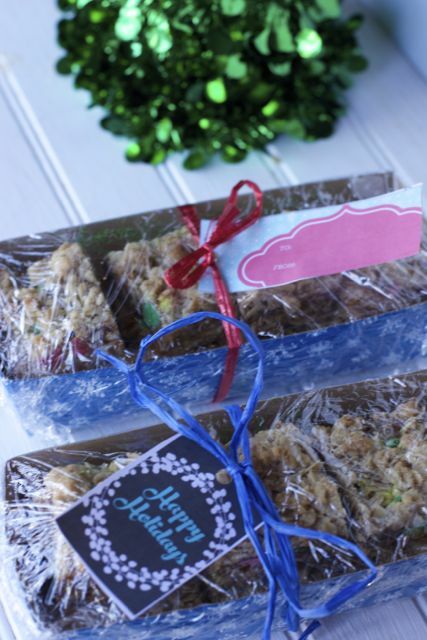 There are some great free Holiday printables here perfect for giving of your baked goods. Be sure to include some fun Christmas Party games to play at your Cookie Exchange. Preheat oven to 350 degrees F. Butter a 9x13-inch baking dish; set aside. 3. Using an electric mixer, cream together the butter and brown sugar on medium speed until combined and fluffy, about 3 minutes. Reduce the speed to low and slowly add the flour mixture until fully incorporated. Add the oats and mix on low to combine. 4. Using half of the dough mixture, press the dough into the baking dish until you have an even layer, with no bare spots. Bake for 10 minutes, then remove from oven. 5. While the bottom layer is baking, combine the NESTLÉ® CARNATION® Evaporated Milk and caramels in a small saucepan over medium-low heat. Stir the mixture constantly until all the caramels are melted and you have a thick sauce. Do not leave the stove at this point. Allow to cool slightly. 6. 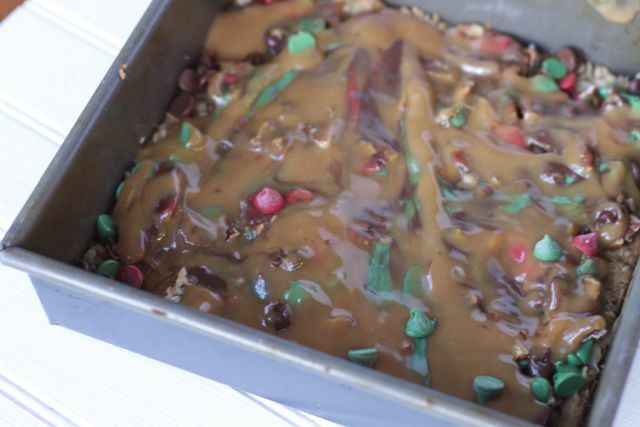 Once the bottom cookie layer is out of the oven, sprinkle evenly with chocolate chips and pecans, and then carefully pour the caramel sauce over the layers. Use an offset spatula to spread the caramel sauce into an even layer. 7. Sprinkle the remaining cookie dough over the top of the caramel-chocolate-nut mixture a handful at a time, making sure to get an even coating over the whole dish. 8. Return the pan to the oven, baking until the topping is lightly browned, about 15 minutes. 9. Once out of the oven, cool the pan to room temperature and then refrigerate at least 2 hours or overnight. 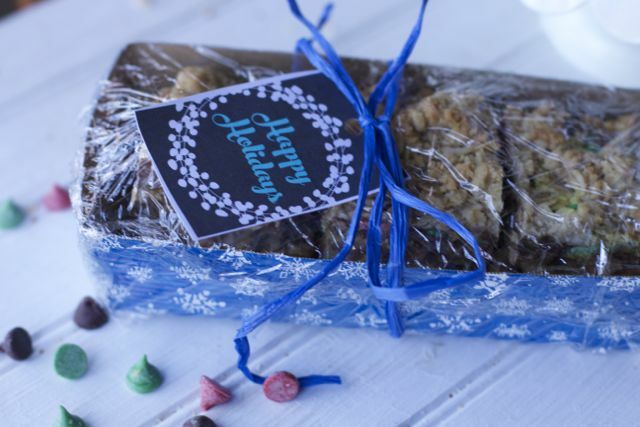 Cut into 2-inch squares and pack up for your Cookie exchange. What is your favorite Holiday Cookie? Be sure to check out more delicious recipes on the Flavorful Moments Pinterest board. I’d love to hear about your favorite recipes to use during the busy holiday season. There are some great cookie exchange recipe ideas there. This would be a new holiday recipe for me. I bet my girls would love to help me make these. hope it goes well. Bars are easy and these are delicious. I plan on participating in a cookie swap this year and was trying to think of something different to make. Found it! Thanks! Oh I’ve never tried these. I’ll have to pin this to try later. I love anything with caramel. I love these colorful chocolate chips! These are perfect for the holidays. Ok wow, these look DELICIOUS! I love the idea of baking during the holidays. I’m nowhere near as talented as you are making up recipes and cooking from scratch, but I love working from a box or bag… Or doable recipes like this. Thanks for sharing! Brown sugar, oatmeal, caramel, and chocolate? My kind of recipe. wow these look delicious! I might make these for Christmas treats this year! That looks amazing. I’m a sucker fro anything with caramel then again I love cookies of any kind. I really like how you decorated with ting ornaments. Yum! I should try a cookie exchange some time. I see them online sometimes and they look so fun! Yum, there are so many delicious holiday recipes online these days we jut might have to make several and gift them in a tin. 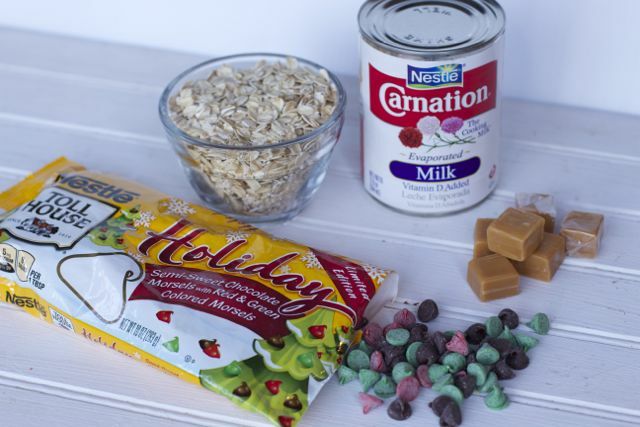 Thanks for sharing this unique oatmeal treat! This is a yummy way to eat oatmeal! I will try this recipe.